What solutions should be employed for fixing small and large tile formats on floors with concrete or cement substrates? Floors concerned: All P4 classified areas not subject to regular motor vehicle traffic. • Work on a dry, sound, clean substrate that does not exude humidity. • Ensure the correct planeness of the substrate. • Comply with the drying times before finishing/jointing. See the Technical Data Sheet of each product. • The product should preferably be mixed with a slow speed mixer. • Respect the pot life of the mixture of quick setting adhesive mortar. • Make sure at least 70 % of the adhesive is transferred to the back of the tiles. 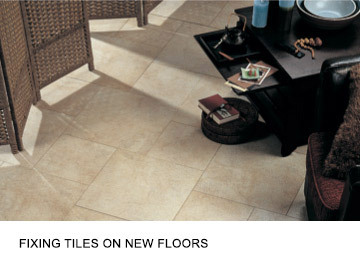 • 2 mm minimum for 20 x 20 tiles or smaller formats as well as natural stone. • 4 mm minimum on electric radiant heated flooring. • 5 mm minimum on exterior floors. • 6 mm minimum for extruded stoneware and terra cotta. EXPANSION JOINTS: Allow for expansion joints in the tiling. CONTROL JOINTS AND SUBSTRATE SHRINKAGE JOINTS Allow for these in the covering and the bonding product except in the case of ceramic tiles on floor more than 3 months old. • Stain sensitive stones should not be used on slabs on an earth platform. • Use systematically CERMIPLUS blanc or CERMIPLUS XL FLEX blanc or CERMIFLOOR HPR after carrying out a test beforehand (stainability). • On electric radiant heated flooring and tiles laid in non heated areas: CERMIPLUS XL FLEX blanc, CERMIFLEX ALG blanc, CERMIFLEX blanc or CERMIDUR blanc. No additional control joints need to be formed within the tiling. Treatment of 5 mm wide areas minimum. DOOR PRE-THRESHOLDS: Should be formed in the screed (and the covering) if it has been applied after the assembly of the partitions. • Normal setting adhesive: the following day. • Quick setting adhesive mortar: the same day. Use KITAJOINT (see instructions); CERMIJOINT for natural stone and CERMIJOINT TX admixed with CERMILATEX in P4 areas or area with heavy stresses and/or intense traffic. • The next day, for quick setting adhesive mortars. • Two days later for normal setting adhesive mortars. • Eight days in P4 areas for the use of heavy maintenance equipment, except for CERMIDUR, CERMIFLOOR N and CERMIFLOOR HPR and CERMIFLOOR ALG (refer to the Technical Data Sheets).